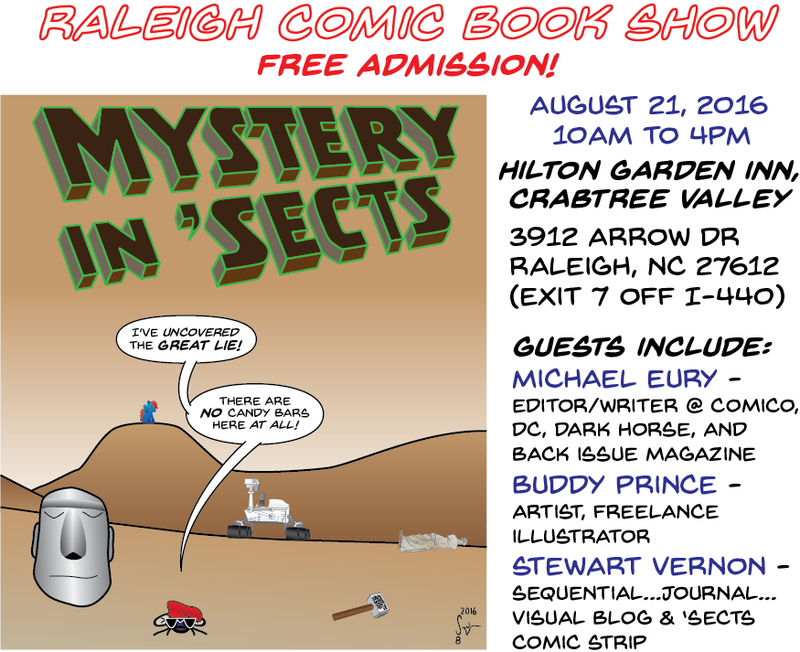 Just found out early last week that I’m going to be a guest at the upcoming Raleigh Comic Book Show, next Sunday! As always, I am looking forward to seeing show runner Lyn Anderson and all the great dealers and convention regulars who attend these shows. 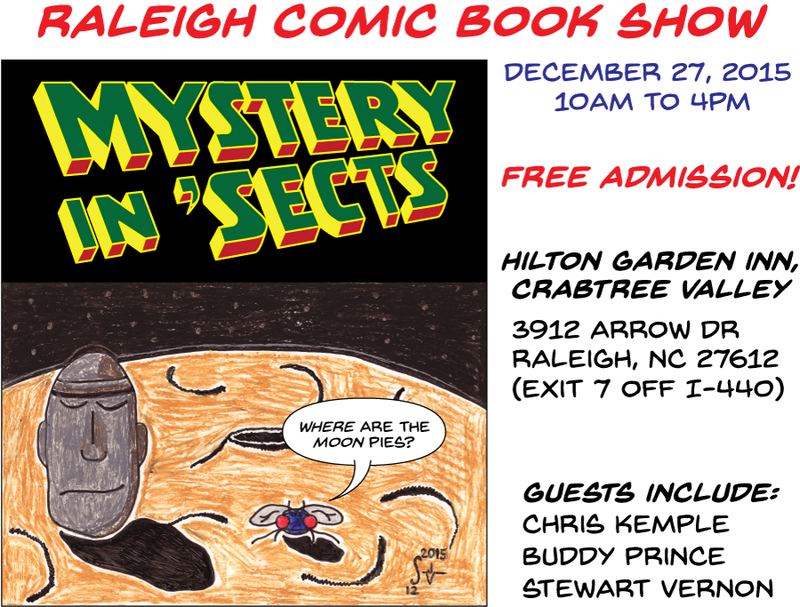 Other planned guests at this show are Buddy Prince, who is a solid artist, good guy, and another Raleigh show regular… and Dan Johnson, whom I have not yet met but am looking forward to seeing for the first time! I will again have original art and sketch cards for sale, including a bunch of new sketch cards from last Inktober that I drew after my last convention appearance. I’ll also have lots of glossy prints of a bunch of illustrations that I’ve drawn over the last few years. Time permitting, I might even be able to do some commission sketch cards or head/bust sketches during the show too. I’m getting ready for the show this week, so I could even surprise myself with new things I don’t yet know I’ll be bringing! I hope to see lots of Facebook and blog followers at the show… and I promise to try and warp your brain with my nonsense while you’re there. 🙂 If you’re anywhere near Raleigh, NC next week you really ought to stop by the show… you will not be disappointed! For those who can’t attend, I will be blogging about the experience sometime next Sunday night as I normally do after these shows. 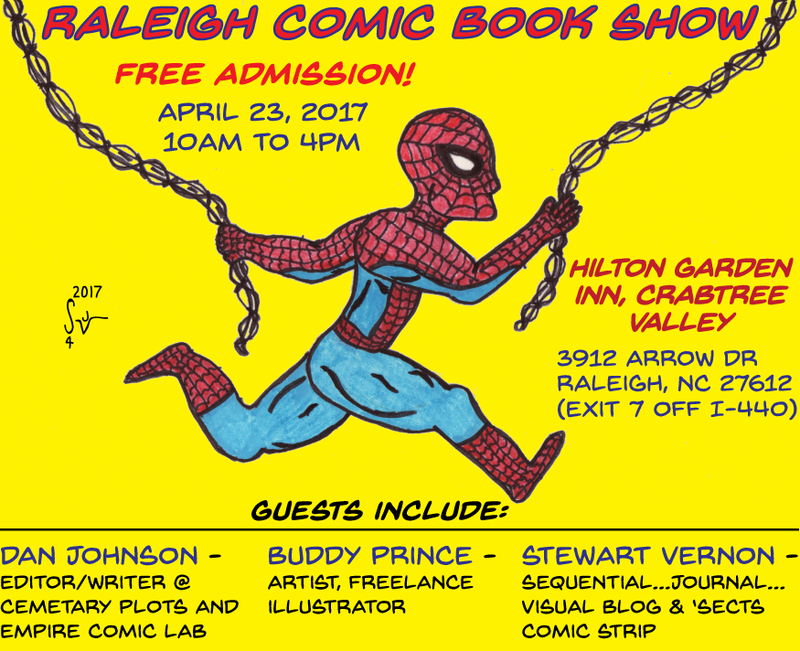 Here we are, nearly a year since my last appearance at the Raleigh Comic Book Show and I am once again an invited guest this Sunday! I’m looking forward to seeing show runner Lyn Anderson and lots of other friendly dealers and convention regulars. I’m definitely bringing some original art and sketch cards to sell. I will also have lots of glossy prints of a bunch of different illustrations I have created over the last couple of years. Time permitting, I might even be able to do some commission sketch cards or head/bust sketches during the show as well. I’m still preparing everything for the show, so I could come up with some surprises. You never know! I hope to see lots of current Facebook and blog followers, and I hope to turn lots of new people over to the dark side as well during the show.. 🙂 For those who cannot attend, I’ll be blogging after the experience on Sunday to let you know what you missed. I hope to see lots of ‘Sects fans there! I’m looking forward to seeing old friends and making some new ones. I’ll also be bringing some freebies and perhaps some original art for sale, and I hope to gain some new followers to the blog and my Facebook page. If you’re a fan of anything you’ve seen from me, please come by and say hello! For those who cannot attend, I’ll be blogging after the experience next Sunday to let you know what you missed. I hope to see lots of ‘Sects fans there! i.e. Sequential… Journal… Visual… Now on Facebook! Because next to nobody demanded it… i.e. Sequential… Journal… Visual… is on Facebook! Actually, I launched about a week ago, and figured it was time to spread the word here. Of course if you are reading this from Facebook, then you already know I’m on Facebook… Facebook! If you read my blog posts and comic strips, nothing is changing… they will continue to be posted here as usual. They will also be pushed to Facebook, and have been since Saturday before last. The advantage to being on Facebook, besides hoping to reach a larger audience… is some shorter spur-of-the-moment things seem to fit being posted there more so than here. Also, I might make snarky comments on Facebook about a cartoon or comic strip… and I might post “coming soon” type announcements there. So, if you are on Facebook please come and find and Like me there so that you can be sure not to miss a thing. Thanks, and… be sure to Facebook! Support the Fist of Justice! Here’s a Kickstarter project from Digital Webbing Studios that you really ought to take a look at, especially if you’re a fan of comics from the 1970s and 1980s! Fist of Justice is a love-fest for classic comic book stories. A totally retro-style superhero dropped into the modern era. Fist of Justice: Changes is the second trade paperback in the series, clocking in at 128-pages of full-color goodness! There is also a brand new comic featuring character Amy Andrews as the Fist of Justice that is only available via this Kickstarter project. It’s all brought to you by Mike Imboden and Eduardo Savid, plus a host of others. Click the image above to be taken to their Kickstarter page for a full accounting of the trade paperback and the pledge rewards. This Kickstarter project is in the stretch run, ending on June 1st, so don’t delay… support the Fist of Justice today! Fist of Justice is also on Facebook, so be sure and check them out there too! Free Comic Book Day This Weekend! Just a heads-up for anyone near a comic book shop that this weekend is the annual free goodies celebration! Remember to stop by your local shop on Saturday and see what they have to offer. Anyone who hasn’t been in a local store in a while, there is no better time to find one and drop in! For anyone in Raleigh, NC I always recommend Capitol Comics on 5212 Hollyridge Dr. Full disclosure, I worked there many moons ago… back when the Earth was as new. Wait, that’s Star Trek… but seriously I did work there (technically at a different location) as one of my earliest jobs while in college. The owner Ken Pleasant isn’t ironically named at all… he makes nice people seem mean by comparison! Lyn Anderson has organized and promoted the Raleigh Comic-Con for longer than I can remember. I went there a lot as a fan and for a while as a dealer, but this weekend will be a first… Lyn invited me to be one of his guests this Sunday to promote my blog and daily comic strip (“From Where I Sit“). So, I’ll be there trying not to make too much of an idiot of myself! In honor of this invitation to appear at my first convention as a guest, here’s a special one-shot extra Friday edition of From Where I Sit. I enjoy poking at the fourth wall now and again, but for this one I decided to blow up the fourth wall entirely, come outside and take a lap around the edge, then go back inside!